Bierebelle is having another shocker of a working week dear readers. Don’t fret though. A black mood can only be cured by one thing and as we all know that can only be a black IPA! Black IPA is a relatively new phenomenon in craft brewing from over in that big ole USA. In a recent CAMRA festival programme I noticed with a little chortle that it can still only be spoken of in quotation marks. On the basis of the beers of this style I’ve been lucky enough to try, a black IPA is characterised by the same crazy levels of hoppage as American IPAs but with added complexities of dark roasted malts and a high ABV. 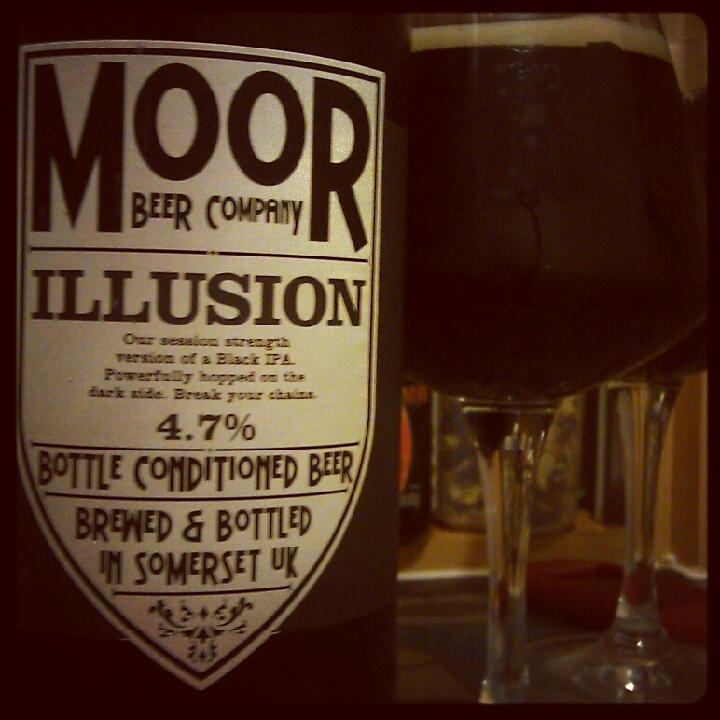 Moor Illusion, at only 4.7% ABV, is an attempt at a ‘session strength’ version of a black IPA. Sold in a generous 660ml bottle, it’s great for sharing but who would blame you for keeping it to yourself? This deep, sleek, black beer pours from the bottle with a thick head which, though short-liked, leaves an elegant white lace shimmering on the surface and sloaping down the sides of the glass as you swirl. The aroma of toasted malts and orange zest are comforting and energizing at the same time. This same toasted malts are the first flavor to hit but there’s a sweet orange-blossom honey trickling through and a tangy citrus hop with a coffee bounce at the end. It’s not quite as over-hoppy or powerful as some of the black IPAs I’ve had, but I think Illusion is perfectly joyful as a light and lovely expression of the style.